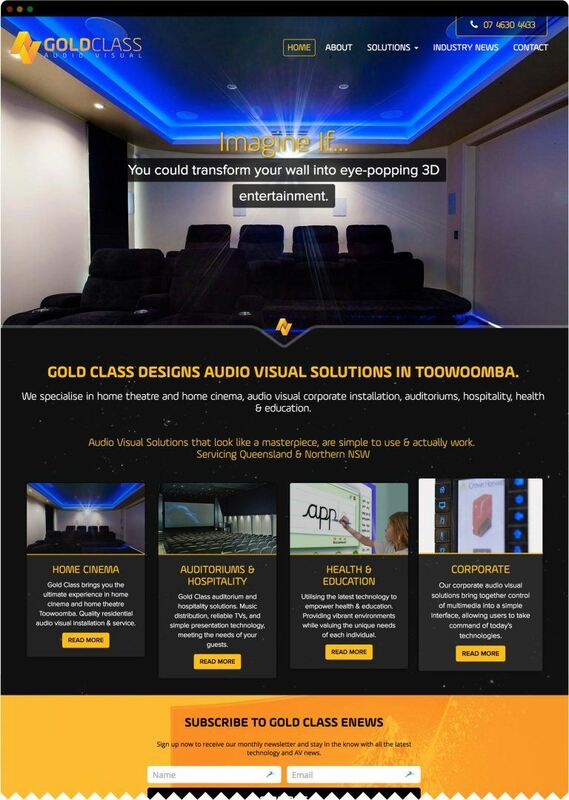 Michael and Jess from Gold Class Audio Visual initially came to us wanting a fresh new logo design and an updated website. They are passionate about quality and this is evident in the work they do. They wanted their brand to reaffirm everything their business stood for. We took time with Michael and Jess to uncover exactly what it was they were after. We looked at some of the projects they had been working on and some of the exciting products that they were working with and wanted the brand to signify this. The dark theme symbolises the quality cinema experience they offer, whilst the gold logo and brand colours represent the quality that their name holds. They website followed suit with this same thinking. We developed a custom WordPress project that allowed them to showcase some of the quality work they had been doing and the products they work with. It also allowed them to capture leads through their industry news section and email newsletter, which we have assisted in the writing and delivery of.